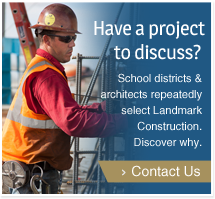 Landmark Construction is building several large projects including new campuses for schools and other industrial facilities and is hiring an estimator, senior superintendent, contractor administrator, construction administrative assistant, IT Support Coordinator and Project Administrator/Engineer for the Sacramento area office. If you are looking for a job in the construction industry and want to work for a quality builder with an outstanding reputation, apply through the Landmark Construction website. Current projects include the $21 million new STAR Academy campus for the Natomas Unified School District. For many years, Landmark Construction has been working on the campus of UC Davis. In November, Landmark Construction completed the new gym for California Middle School and the Sacramento City Unified School District. The City of Vacaville water treatment laboratory building was also recently completed. A lot of new contracts are just getting underway and new hires will have an opportunity to contribute to the success of these major construction projects. Since 1998, Landmark Construction has developed a collaborative management style that has resulted in 100% on-time project delivery within budget and without problems. This success is due to highly qualified and committed employees. The growing company offers opportunities to expand your skills and qualify for promotions. It is the perfect blend of interesting, challenging projects within a company where you can make your individual impact and easily access top management with your ideas for innovation. Landmark Construction is seeking employees who have industry experience and are interested in working in a collaborative environment where challenges are identified ahead of time, all employees are encouraged to contribute ideas to solve problems and communication with clients is a high priority. Additionally, the safety of worksites and employees is ingrained in the company culture and backed with regular training and external safety audits. Quality workmanship is expected on every aspect of all projects. The camaraderie among staff makes Landmark Construction a fun place to work. The company is known for working hard and playing hard. The Loomis-based contractor regularly supports employees’ participation in sporting events as well as other community activities that benefit education. For instance, Landmark is the major sponsor of the Go the Distance 24 hour relay race and 5K Aqua Color Run on May 13-14, 2016 in Loomis. To help employees maintain a work life balance, Landmark Construction offers staff a discounted gym membership as an employee benefit. Staff barbeques are also a Landmark tradition. Employees enjoy the company’s active outdoor culture, and regularly take advantage of the Loomis’ office close proximity to Folsom Lake, Gold Country foothills, Sierra Nevada mountains and numerous waterways for biking, hiking, sailing, skiing, rock climbing and other sports. Employees routinely organize informal trips with co-workers who love the great outdoors. Long term employees say that the work environment is unusual in the building industry in that the focus on collaboration with subcontractors and clients impacts every aspect of the business. Employees are valued members of the team who do the right thing for the customer and work to meet clients’ needs whether it is a small renovation or multi-million dollar project. The internal office environment is similarly collaborative. Landmark Construction offers employment opportunities in a work atmosphere unlike most general contractors. Current staff also appreciates the small town atmosphere of the Town of Loomis where the corporate office is located. It is considered a friendly place, where people greet you on the street. You can easily attend community events such as the Eggplant Festival, and enjoy cowboy poetry or concerts at the Historic Blue Goose Fruit Shed. The open space and semi-rural lifestyle is very attractive for employees who enjoy coming to work at the Loomis office. Make your next career move to a company where your individual efforts will be recognized. Enjoy working in a collaborative, supportive atmosphere where you’ll be proud to build large, high quality landmark projects. Apply for employment opportunities at Landmark Construction on the website.